Each session will begin with a talk by Geshe Lobsang Tenzin, Spiritual Director of Drepung Loseling, on the benefits of meditation and instructions on how to engage with it. Geshe Lobsang will then lead a guided meditation session for participants to engage in the practice of meditation. This will be followed by a question and answer period. This is an opportunity for newcomers to learn about meditation in a friendly and informal atmosphere. There is no dress code, but you may wish to wear comfortable clothing for sitting. Cushions and chairs are provided. It is also an opportunity to learn about Drepung Loseling, our activities, and membership. Geshe Lobsang Tenzin was born in Kinnaur, a small Himalayan kingdom adjoining Tibet. At the age of 14 he received his ordination from His Holiness the Dalai Lama and began training at the Buddhist School of Dialectics, the private school of His Holiness the Dalai Lama in Dharamsala for seven years. In 1985, Geshe Lobsang entered the Drepung Loseling Monastic College to continue his training in Southern India. In 1991, he was sent to Atlanta by the Monastery to establish and oversee the development of Drepung Loseling Monastery, Inc. that serves as the North American seat of Drepung Loseling Monastery. In 1994, he was awarded the degree of Geshe Lharampa, the highest degree of learning in Tibetan Buddhism, from Drepung Loseling Monastery. 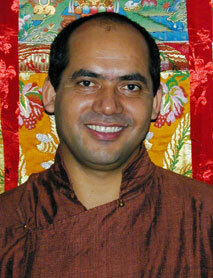 Geshe Lobsang received his Ph.D. from Emory's Graduate Institute for the Liberal Arts in 1999. His dissertation centered on traditional Buddhist and contemporary Western approaches to emotions and their impact on health. He serves as Spiritual Director of Drepung Loseling Monastery, Inc.and teaches as a Professor of Practice at Emory University, where he continues to engage in on-going research on mind/body medicine and the function of meditation in promoting health and well-being.